This is a strange year in fantasy football drafts when it comes to quarterbacks. Typically, quarterbacks are a hot commodity, but this year quarterbacks are slipping down draft boards much more than usual. The first quarterback isn’t being drafted until the middle of the second round, and the second quarterback isn’t going until the middle of the third. After that, it’s a free fall with the third quarterback not being taken until the fifth round. This might be the perfect year for you to try the “Quarterbacks by Committee” strategy. What you do is you wait on drafting your starting quarterback until the middle rounds (Rounds 7-10), and you draft two of them back-to-back. This works even better if you have a very high or very low draft position in your snake draft so you can make these two picks virtually back-to-back. The other guys in your draft won’t know what him them. Last time they picked there were a couple more quarterbacks available, and all of a sudden you’ve taken two solid ones off the board like that. Your strategy on doing this is to get one quarterback that is a lower-tier borderline fantasy football starter and pair him with a guy who can be used as a bye week filler as well as a “tough matchup” filler. Your goal is to try to avoid any difficult defenses for your starting quarterback position. By strategically playing the easier matchups for the two quarterbacks you draft, you can build yourself a top-tier quarterback in terms of fantasy points. If you can play their matchups correctly, over the course of the season you’ll have gotten yourself top-tier quarterback production without drafting one and stocking up on top-tier talent at other positions early in the draft. This strategy does come with some risks. First you have to be able to get both of the guys you’re targeting. This is easier if you have a swing pick (Picks 1,2, 11 or 12) so you can draft both of these guys back-to-back or close to it. If you’ve got a pick in the middle of the draft you’re taking more risk using this strategy since your second quarterback could get picked before the draft gets back to you. You’re also taking the risk that you can pick which quarterback to start each week. There will be weeks where one of your guys has a huge game while sitting on your bench and you’ll be kicking yourself for not starting him. You could also get lucky and one of your quarterbacks turns out to have a great year and you don’t have to guess which one to start, so there’s some upside there. 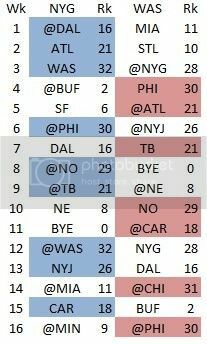 I took a look at which teams had the hardest (first-ranked team) and the easiest (32nd-ranked team) schedules in terms of fantasy points allowed to quarterbacks last season and I’ve selected a few quarterbacks from the middle rounds while also selecting another quarterback who matches up best with them. I haven’t included any top guys, because if you’re drafting Aaron Rodgers, Andrew Luck, Russell Wilson, Cam Newton, Drew Brees or Peyton Manning you’re most likely starting them in every game you can. I’ve also left out the extremely low ranked guys who might not even be starting for their teams. Quarterbacks for Buffalo, Cleveland, Houston, and the New York Jets along with rookies Jameis Winston and Marcus Mariota are all guys you’re not going to want on your roster if you’re going to use this strategy. Tannehill pairs well with Philip Rivers, and this is probably one of the safest quarterback pairs you can get. Not only did both of these guys have more than 4,000 passing yards and at least 27 touchdowns, but both appear to be in line for a better year this year. Miami made a lot of moves with their receivers this offseason by trading Mike Wallace, drafting DeVante Parker, and bringing in Jordan Cameron and Greg Jennings. San Diego made moves as well by drafting a solid running back in Melvin Gordon to take some attention away from the passing game. They also brought in Stevie Johnson who is only two years removed from three straight 1,000-yard seasons in Buffalo. By pairing these two quarterbacks together the toughest defense your starting quarterback would see would be when you have to play Rivers at Minnesota in Week 3. After that, you don’t even see a team ranked in the top half of the league. You also get some good matchup games in the weeks that matter (Weeks 13-16), but not so easy that the run game will become the focus. Other quarterbacks that pair well with Tannehill are: Tony Romo and Eli Manning. I know Brady’s suspension is still looming out there, but if he is gone for the first four weeks of the season, his true handcuff isn’t Jimmy Garoppolo it’s Sam Bradford. 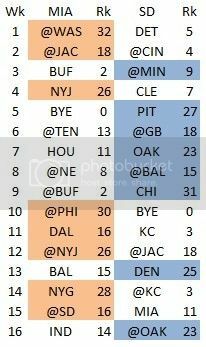 Philadelphia starts out the season on the easiest schedule in the league. While Brady is riding out his suspension on the bench, you’ll have Bradford and half a dozen straight easy games to get you through. After that you can throw Brady into your lineup for the rest of the season. You’ll have 13 games against teams that ranked 21st or worse last season in fantasy points given up to quarterbacks. You’ve got a top quarterback, and you’re team hasn’t suffered through having Garoppolo as your quarterback, and all because you paired your quarterbacks correctly. Other quarterbacks that pair well with Tom Brady are Tony Romo and Robert Griffin III. Romo had a bit of a down year last season, but that was because the run game was so good. With DeMarco Murray out of Dallas, you have to think that the Dallas Cowboys are going to throw a bit more this season. Dez Bryant does his thing, but also look for third-year receiver Terrance Williams to contribute as well. 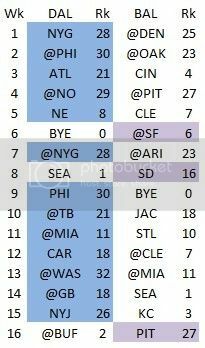 Romo’s two toughest fantasy games of the season are against the two toughest defenses for quarterbacks to face, Seattle and Buffalo. You can avoid these two tough games by drafting Joe Flacco. He’s not nearly as good of a quarterback as Romo, but you really just need him for three games. If you grab Romo, pair him with Flacco so you don’t have to suffer through three down weeks on your season. Other quarterbacks that pair well with Tony Romo are Matt Ryan and Sam Bradford. This is probably the riskiest pairing around but it also has a ton of potential. Fantasy footballers seem to have forgotten that Manning has Odell Beckham and Victor Cruz to throw to with very little semblance of a run game in New York, while Robert Griffin III will be throwing to DeSean Jackson and Pierre Garcon. When you pair these two quarterbacks together you get the easiest schedule you can create between two quarterbacks. You’ll never have to start a quarterback against a team that was in the top half of the league against quarterbacks last year. Your toughest matchup will be Manning at Dallas in Week 1 while three of your last five weeks you get to face the three easiest defenses versus quarterbacks last year. 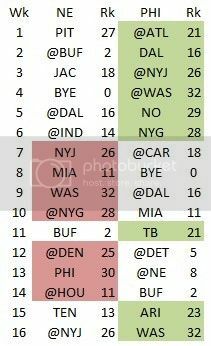 As you can see, this pairing makes for a very easy quarterback schedule. Other quarterbacks that pair well with Eli Manning are Tony Romo and Sam Bradford. Previous THE PRESEASON REPORT IS ONLINE!! !